Uncorked is an acoustic live album by Al Stewart with Dave Nachmanoff. It was recorded on their spring tour of the East Coast of the USA in 2009 and it was released later the same year. Back in 1992, Al Stewart recorded an acoustic live album called Rhymes in Rooms which he made with Peter White. It was a deliberate decision to avoid repeating any of the songs on that first album. The decision to avoid songs on the Rhymes in Rooms means that this has less well known songs which may make it more appealing to fans but less interesting to more casual music listeners. 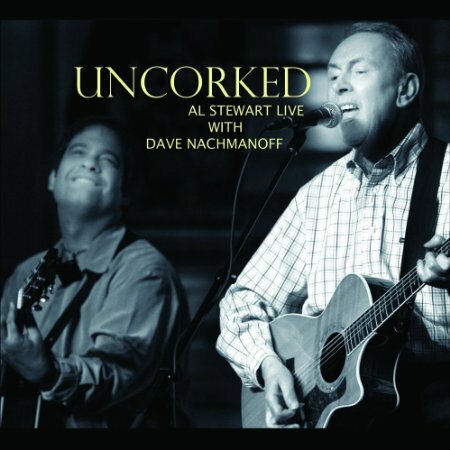 This entry was posted in 2000s Live Albums, Singer Songwriter Live Albums, Unplugged & Acoustic and tagged 2000s Songwriters, 2009 live albums, Al Stewart Live Albums, SS S by Paul Simister. Bookmark the permalink.